So often I hear folks telling me they can’t dance, so why even try. Or they’ll come to Sundance Saloon and take one lesson and give up. But it doesn’t have to be that way! I truly believe everyone who can walk can two-step, because I’ve seen it happen again and again with “hopeless” cases. Give it a chance, and the rewards are great. Rome wasn’t built in a day. Sure there are a few talented folks who somehow grasp the concept in one lesson. But for us normal folks it can take weeks or months before two-stepping even begins to feel natural. And don’t compare yourself to folks on the dance floor who have been doing this for twenty years. They’ve been doing it for twenty years! I don’t know why newbies resist this suggestion. It really helps. Let your dance partner know you are a beginner and have her help you count! When you are starting out it is nearly impossible to two-step and carry on a conversation, so don’t even try. Try counting instead. True fact: it took me six months of dancing every week before I could talk and dance at the same time. Six months! No they’re not. And if someone is looking at you, it’s probably because he’s thinking “how adorable.” We spend so much of our lives trying to get noticed! You want to be noticed! More visibility = more dance partners = more fun. Don’t stand in the shadows behind the crowd. Sundance Saloon is a friendly place. If someone asks you to dance, say yes (it’s OK to tell him you are a beginner). Don’t be afraid to ask someone else to dance. I know, it’s terrifying. But the more you get out on the dance floor, the faster you’ll feel comfortable in your boots. Force yourself to meet one new person each time you come. If you come once a week, in a year you’ll have fifty dance partners! 5. Ask good dancers to dance with you. This seems counter-intuitive. Beginners often enjoy and end up dancing with other beginners. But you are going to learn so much more when you dance with someone who is better than you. Did I say this already? Well, you can practice outside of Sundance Saloon too! Walk around your house stepping slow-slow-quick-quick, or if you’re really brave try it going down the sidewalk or while pushing the cart down the grocery aisle. Hey, this is San Francisco. No one will notice. 7. It’s OK to make mistakes. Stop saying “sorry” every time you mess up. You’ll probably say it anyway, but understand it is not necessary. 8. Reward yourself as you reach a milestone. The first time you do a slow-slow-quick-quick pattern successfully, clap your hands. The first time you make it all the way around the dance floor, say a little cheer. The first time you get through an entire song – now that calls for chocolate! Starting out is a little bit like torture, but ultimately it’s about having fun (and I don’t mean to imply this is a form of SM). Sure there may be an element of frustration that’s not so much fun. But think about the new connections you’re making, about the human contact you can’t get anywhere else, and how many times you smiled or laughed during the night. So maybe you didn’t do so well at your first outing. That doesn’t mean you can’t dance. I know someone who loves to tell the story that when he started out, his friend told him, “You may be one of those people that never quite gets it.” Well, he didn’t give up, and now years later he’s a dance instructor! Keep trying and I promise you it will eventually click, and it is soooooo worth it. 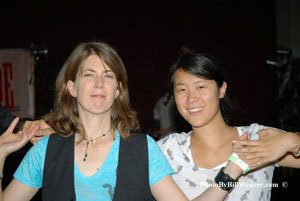 This entry was posted in Dancing and tagged Beginners. Bookmark the permalink.